The spark for SURE FOOT came two and one half years ago. 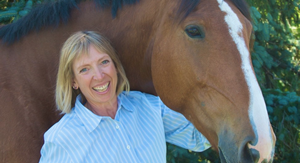 I got the idea to place an air-filled balance disc under a horse’s hoof, thanks to Dr. Joyce Harman and a horse named Dante. I wanted to help him sense his own body. For one month he was ridden in a saddle that caused a problem with his right hind leg. We changed the saddle but the uneven movement was still visible at the end of the Monday lesson. I was going to see him again the next day. During our conversation Joyce talked about how dogs were placed on a variety of unstable surfaces for rehabilitation. I wondered how that would work with Dante. She thought it might help and suggested he only stand on the balance disc for 15 seconds. In 15 seconds my life changed in the most unexpected way! Andy, the third horse that day, was a Halflinger. 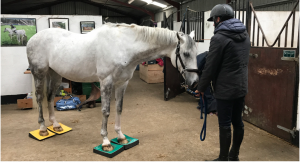 He was used for therapeutic driving and his owner, Catherine Wycoff PT PhD, Hippotherapist and Feldenkrais Practitioner, rode him to keep him fit. This horse was totally cool about standing on the pads under both front and back feet. Again the canter went from a very heavy, on the forehand to one that was round and light in less than 1 hour. Catherine and I had a long discussion afterward about what might be happening to the horses. We weren’t entirely sure (even now no one can fully explain what is going on) but we definitely intrigued! Some horses will not stand on the stability pads at all. 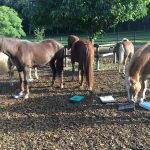 In those cases it is important not to force them and to consider other factors that may be underlying the reason for your horse’s concern. The few horses that I have seen that will not stand on the cushions have been diagnosed with neurologic problems. This makes sense a neurologic horse is already unstable and therefore cannot cope with being made even more unstable. What happens during a SURE FOOT session? In general the horses calm down, relax and explore the feeling of standing on an unstable surface. Observable changes include: head lowering, eye blinks, eyes closing, softening of the muzzle, ears relaxing and in general a switch from the sympathetic (flight and flight) nervous system to the parasympathetic (grazing) response. Some horses go into a deeper level of relaxation that is similar in appearance to horses that are sleeping or drugged. 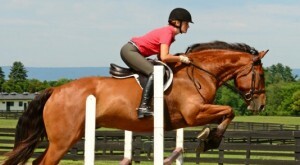 SURE FOOT allows the horse to sense a new way to stand on his feet because the surface gives. This alters the way your horse stands, moves and behaves. I think almost all behavior problems are balance problems and when the horse feels a different balance on his feet he becomes more secure and sure-footed. Having put hundreds of horses on stability pads I know it works and fast! And, more importantly, the horse is his own teacher. His self-exploration is what makes SURE FOOT work. The horse is in complete control of the process and the outcome. Allowing your horse to sense, feel, and play with standing on a surface that gives under his hoof, or reject the idea completely puts him in control of the process. In this way he becomes his own teacher. He gets to decide which foot he wants on a pad, how long he wants to stand, how he wants to explore and what happens when he steps off. 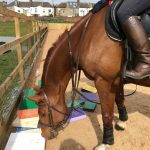 You can use SURE FOOT with your horse while mounted (you will need an assistant) or unmounted, in an arena, barn aisle or anywhere he may become anxious. You can use it to solve or improve a variety of behaviors like Mugsy’s issues with being tacked up. 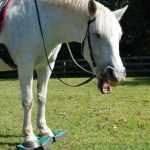 Others have used SURE FOOT to help horse’s that couldn’t back up, have difficulty standing for the farrier, shivers, shy, high headed or short gaited. I know of two horses that stopped twisting their hocks. I hope you will give SURE FOOT a try and please let me know what happens! I am looking for case studies for the SURE FOOT book so please email me with your stories, wendy@wendymurdoch.com. For more information and a video of a horse on 4 pads go to www.murdochmethod.com and click on SURE FOOT.